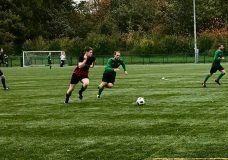 This weekend, two games took place in the SportsReach football league, both being played on AstroTurf, in order to have the games played due to the recent poor weather! 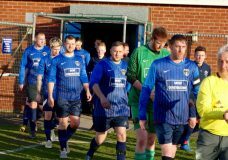 Loko made the short trip to face Moorlands, whilst Quernmore played Wray, the first of several upcoming games between the pair, with the semi-finals of the League cup coming soon. Unfortunately, Great Ecc’s home game against Lancaster had to be called off. 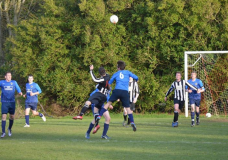 In the early kick off, Moorlands faced Loko, with Loko looking to bounce back from last weeks defeat to Quernmore, and they got the perfect start, taking the lead within 4 minutes of the kick off. Just the start Loko would have been looking for. However, Moorlands weren’t behind for long, equalising through top scorer Grundy. The game was an even contest, both sides cancelling each other out until the 31st minute as Moorlands took the lead, again, through Grundy. Nine minutes later and Moorlands compounded Loko’s misery as they scored again in the 40th minute through winger Max Ward. 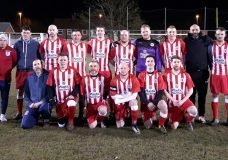 The half that had started so well for Loko had soon gone in Moorlands favour and into the second half, Loko were looking for the next goal in the game to make it a more even contest. However, much like the first half, both sides cancelled each other out for much of the half, only in the 80th minute was the next goal of the game scored. Hunar Mawlood scored his first goal for Moorlands, and their fourth of the game, to wrap up the victory for Moorlands. In the ‘Farmers derby’ Quernmore travelled to face Wray in good spirits after their victory last weekend, whilst Wray’s last game had been a 4-0 loss to league leaders Great Ecc. Quernmore were hopefull of a good result, but were missing some important players. Wray started the game the better of the two teams, putting together some good moves and coming close with some good chances. After some excellent work from Will Preece on the wing, he cut inside and fired a shot underneath keeper Thornton. Quernmore tried to find a way through a tough Wray side, but struggled to penetrate the back line, though some good work from striker Sutton allowed Quernmore a few opportunities, albeit ones that came to nothing. Wray stretched their lead further, with more good work down the right wing, this time from Lawson, who played a beautiful cross into the box for striker Kelsall to fire home. 2-0. Wray continued to press and Quernmore continued to struggle to contain them. A third goal soon came, Preece nabbing his second of the game. Quernmore’s misery was compounded some more as Wray found a fourth goal before half time, Kelsall netting his second of the game. Quernmore, aware they had been outplayed in the first half, made some tactical changes and moved into a 4-3-3 to try and have more bodies in the midfield. Quernmore started the half brightly, the new attacking three of Kelsall, Sutton and Yates looked promising. However, in the 50th minute, Quernmore’s good start unraveled, as miscommunication between keeper and centre half allowed Preece to nick in and get his third and Wray’s fifth of the game. There were no more goals in the game, but it continued to be a very good battle, Quernmore working hard to try and find a consolation, whilst Wray looked to extend their lead. Both sides continued to cancel each other out and with that it was full time, Wray taking the win 5-0, standing them in good stead for the first leg of their semi-final in two weeks, whilst Quernmore will want to give a better account of themselves in the next game!